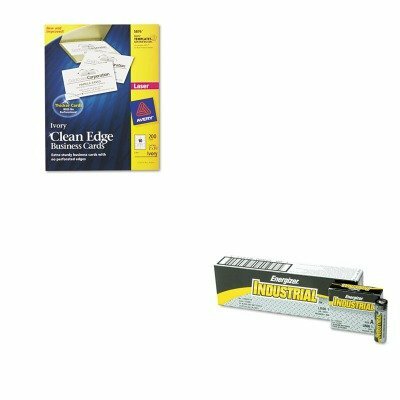 strongAVE5876/strongBR/Avery Two-Side Printable Clean Edge Business CardsBR/High-quality, heavyweight cardstock. Clean Edge technology ensures cards snap apart with smooth, non-perforated edge. Printable on both sides for double the space. Easy to use with free Avery templates and software. Paper Colors: Ivory Finish: Uncoated.BR/BR/strongEVEEN91/strongBR/Energizer Industrial Alkaline BatteriesBR/Economically power your heavily used, high-current-drain devices. Industrial-grade batteries provide dependable, powerful performance that keeps you going. Alkaline cells are designed specifically for professional applications. Battery Type: Alkaline Battery Size: AA.